I’m a big fan and I expect a lot from K.V. Anand and his writing team of Subha but sadly Maattrraan fails to deliver despite the presence of two Suriya’s, the hint of a good story and the best efforts of all the cast. I was expecting the worst when I read about that the plot involved conjoined twins since anything even vaguely medical in Indian cinema is always replete with the totally impossible and that’s exactly the case here. As if the ridiculous medical themes weren’t enough to deal with, the second half also has plot holes and inconsistencies big enough to swallow a small asteroid while it treads a well-worn path without any real excitement or tension. Just to cap it all off, Maattrraan also has one of the most ridiculous and unsatisfactory endings I’ve ever seen in a Tamil film! It’s not all bad though. The first half is generally entertaining and the interaction between the twins is engaging, but when the best chemistry in the whole film is between Suriya and himself then you know things aren’t looking good. Suriya plays conjoined twins Akilan and Vimalan, who are almost separate, but can’t actually be separated because they only have one heart between them – which is only the start of the questionable medical statements. Vimalan is intelligent, quiet and studious and completely different from his drinking, smoking and music-loving brother. They tend to overlook the fact that only having one heart means they share the same blood supply so if one twin was blind drunk, the other one would be intoxicated too, but logic never really intrudes on their relationship. The differences between the two would have worked well for two fifteen years olds but seemed a little out of place in two grown men, especially since Akilan seems to be channeling late seventies Rod Stewart most of the time. 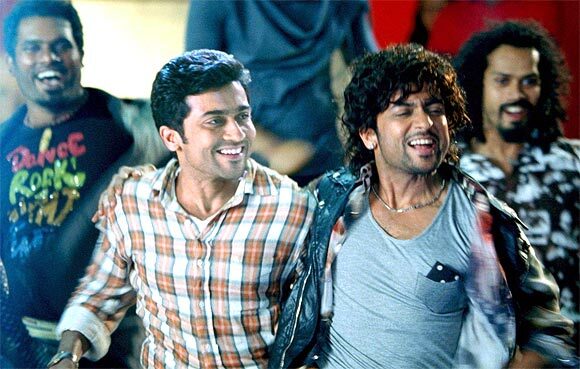 But the relationship between the brothers is the best part of the film and Suriya convincingly plays the part of the conjoined twins making them seem real rather than the product of a special effects team. The twins are the offspring of Ramachandran (Sachin Khedekar), a genetic scientist who was forced out of Russia by the end of the cold war. After some financial difficulties he set up the increasingly successful business of Energion, an energy drink for kids which consistently outsells and out performs all its competitors. Add in a suspected Russian spy who is actually a journalist reporting on the connection between Energion and a health supplement which had serious side effects in a group of young Russian athletes and the scene is set for some dodgy chemistry and dubious genetic manipulation. The film tries to ramp up into an action thriller, but since we know the villain is the rather mild-mannered Ramachandran along with his faithful side-kick Dinesh (Ravi Prakash) there aren’t many thrills to be had. The fight scenes, especially one at the end of the first half between the twins and an assortment of thugs in an amusement park, seem to drag on forever. Perhaps it’s the challenge of the conjoined twins but even in the later fights, Peter Hein’s choreography isn’t as effective as usual. There doesn’t seem to be any real reason for Akilan and Vimalan to be conjoined twins other than a gimmick to grab our attention. It’s difficult to tell without understanding the dialogue, but there wasn’t enough in their relationship to fully explain why most of the budget had to be spent on creating the duplicate Suriya effect. Especially since the rest of the film seems to have suffered as a result. K. V. Anand films usually have great explosions, thrilling chase scenes and innovative fight sequences, but here the best of them are muted and the helicopter crash in particular is a rather damp squib. Two brothers would have worked just as well, and although I get the nod to the fact that their father was a genetic scientist and the sequences with Akilan missing Vimalan in the second half were good, it wasn’t enough for me to justify the conjoined aspect. Kajol Agarwal plays the role of Anjali, who starts off interested in Vimalan but then seems to change her allegiance to Akilan without too much distress in the second half. Rather more believably, Anjali is a Russian interpreter which at least allows her to feature occasionally in the action and Kajol is fine in her role. Since the other female protagonist is the rather stilted and uncomfortable-looking Russian journalist, Kajol is also the better dancer which gives you a clue that the dance sequences aren’t anything too great either. Even Suriya appears awkward for most of the choreography and the best thing about the songs are Kajol’s beautiful saris and skirts. One song appears to have been shot in the Fjords in Norway and the scenery is absolutely stunning but also totally overshadows any hint of romance between Suriya and Kajol. The basic story could have worked well, but it’s buried underneath all the CGI and far too many irrelevant trimmings that work against building excitement or tension as the plot unfolds. 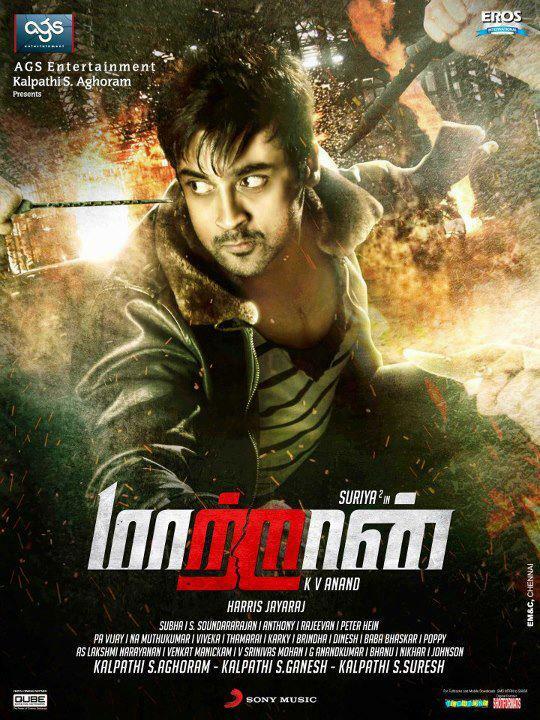 Suriya is excellent and worth watching but that’s not enough to hold Maattrraan together. If you can watch with a willingness to completely suspend disbelief and don’t mind the constant clichés then this is probably a film that you will enjoy. Otherwise wait for the DVD where judicious use of the FF button will likely make Maattrraan more watchable. This entry was posted in Kollywood and tagged Adventures without subtitles, Ajay Rathnam, Harris Jayaraj, Isha Sharvani, K.V. Anand, Kajal Agarwal, Maattrraan, Peter Hein, Ravi Prakash, Sachin Khedekar, Subha, Suriya, Surya, Tamil, Thara. Bookmark the permalink. I did not see this movie or any Indian movie for a while, but in general I like Suriya and how he brings heroism/comedy to Tamil Cinema. I think Tamil Cinema is known for its natural slapstick comedy and it’s something Suriya cannot detach from his on screen persona due to Tamil Cinema’s emphasis on slapstick comedy being an integral to providing its insatiable audience several comedy reels. I would love for Suriya to also cross into Bollywood like Siddarth in Rang De Basanti, but given how some South Indian actors have often had mainly comedic roles in Bollywood movies I can understand why Suriya has not done any major Bollywood movies. This recent Bollywood movie of Aiyyaa with Rani M. and another prominent South Indian actor in the lead shows why some South Indian actors are hesitant to do Bollywood movies as they’re propped up to provide mainly comedic scenes like in this music video from the recent Aiyyaa movie: http://www.youtube.com/watch?v=sYK1o261F18. I only saw this video clip a week ago, but I still can’t stop laughing at it. If this movie Aiyyaa was to pay homage to South Indian Cinema/audience it has drastically failed at this objective as Tamilians don’t like to be thought as buffoons even though they act like it in their own movies, so Tamilians only like to be made fun of by Tamilians exclusively. But, to be fair I am still thankful for the Dreamam wakkeppam song only because it’s beyond hilarious even though it’s also simultaneously offensive to Tamilians. I like Suriya too which is one of the reasons why I was disappointed in this film. It’s a fault of the story and film pacing through rather than the actors who do all give it their best shot. To be fair there isn’t a lot of slap-stick comedy and most of the humour seemed to be in the dialogue – at least that’s what the audience was laughing at. I can totally understand why the Southern actors don’t feel the need to venture into Hindi films. They already have a large fan base in the south and as you say the roles in Bollywood films don’t appear to be anything worthwhile to attract them. However things may be changing and one actor who has made a name for himself in Bollywood is Rana Daggubati who had fairly decent roles in Dum Maaro Dum and the otherwise woeful Department. I’m interested to see how Dhanush fares in Raanjhnaa too although I’m not looking forward to sitting through more of Sonam Kapoor’s wooden acting! Charan is also filming Zanjeer in Hindi so maybe there will be a new influx of Southern stars into Bollywood – it desperately needs something! I did have a look at the clip you linked and thought it looked dreadful! Poor Rani and Prithviraj!